In 2007, I had worked with Will Aitken as a teaching assistant on an Integrated Activities course at Dawson College in the Cinema and Communications department. 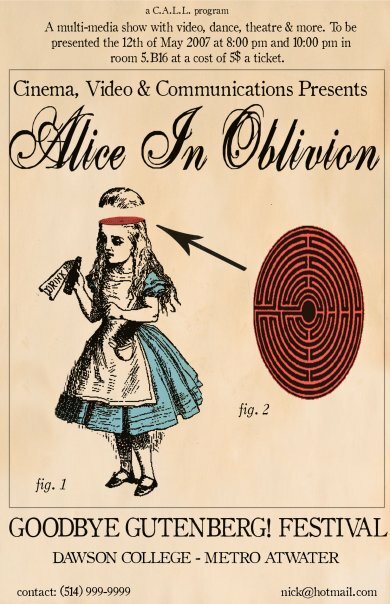 We used Lewis Carroll’s Alice’s Adventures in Wonderland as a springboard and theme to engage the students in a dialog about the different psychological coping mechanisms for trauma. The end result was a collaborative live-multimedia production titled Alice in Oblivions, consisting of a series of videos and live-performances.